Joint pain is a common affliction among women, particularly when they approach their menopausal years and as they continue to get older. In fact, studies have shown that around 26% of women are diagnosed with arthritis - which is possibly the most frequently seen of acute joint pain causes. Because of its prevalence, it is advisable to try to enhance your understanding of the different causes and treatments, in order for you to better cope with any intense joint pain that you might encounter. What Causes Extreme Joint Pain? Arthritis. There are a few different types of this well-known condition, but it is osteoarthritis that affects most women. This develops with age, and involves the deterioration of cartilage that exists in the joints - causing stiffness, inflammation, and sometimes acute pain. Sprains and injury. As we get older our bodies become more vulnerable to damage, and unfortunately the natural healing process takes a little longer. Because of this, pain from injury that has caused a sprain or broken bone is likely to be severe and persistent. Repetitive strain. For those who regularly undertake specific activities such as tennis or gardening, acute joint pain is sadly considerably probable. This is due to the consistent pressure on certain joints, and the fact that the repetition of action inhibits sufficient recovery. 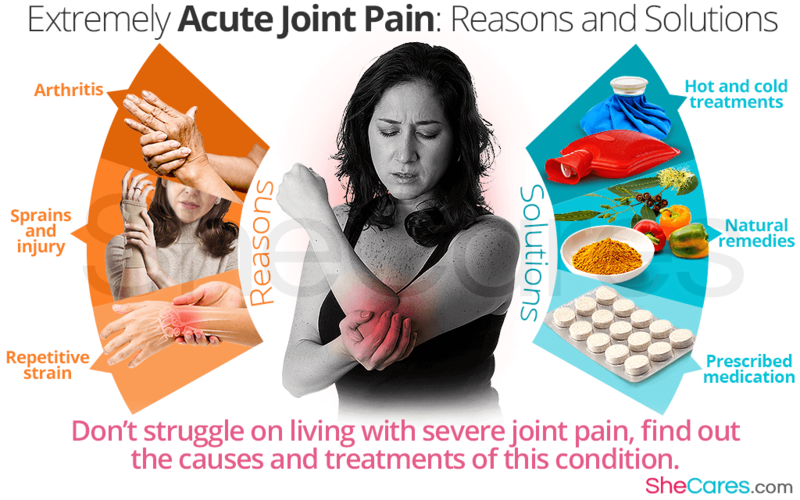 How Can Severe Joint Pain Be Treated? Hot and cold treatments. Depending on your own personal receptiveness to temperature, hot or cold treatments might be more effective in relieving intense joint pain. An ice pack, hot water bottle, or heat sprays and freeze lotions are just a few of the popular options. Natural remedies. Many different plants and herbs can be considerably effective for analgesic and anti-inflammatory uses. Eucalyptus, turmeric, and capsicum in chilies, are all widely available, both as topical and oral treatments. Prescribed medication. Your doctor might prescribe non-steroidal anti-inflammatory drugs (NSAIDs) - these are able to reduce pain and inflammation, and are available as a topical treatment of in the form of a tablet to consume orally. Women who suffer with extreme pain in joints often find that the pain can easily get the better of them, particularly if they are unaware of the reason behind the condition. With some knowledge about common causes, it should be somewhat simpler to find an effective solution for acute joint pain - whether this be a permanent cure, or valuable management method.